This abstract piece features the silhoutte of a sun in solid colour, reflected in a pool far below. The surrounding sky is devoid of clouds and birds and forms a uniform background in reddish-orange. 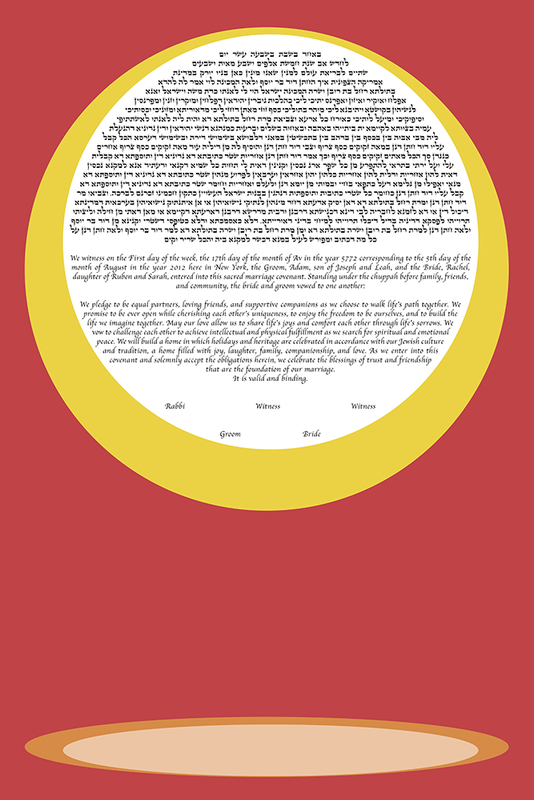 The text of the ketubah is enclosed within the circle of the sun and will form a versatile piece to hang up on any colored wall. This ketubah is perfect for fans of abstract digital art. The symbol of wholesomeness and strength makes a fine carrier of your signatures and terms of marriage. Couples compared to the sun, are those who shine light on all those around them and are a permananet presence in each other’s lives radiating warmth and life into one another.